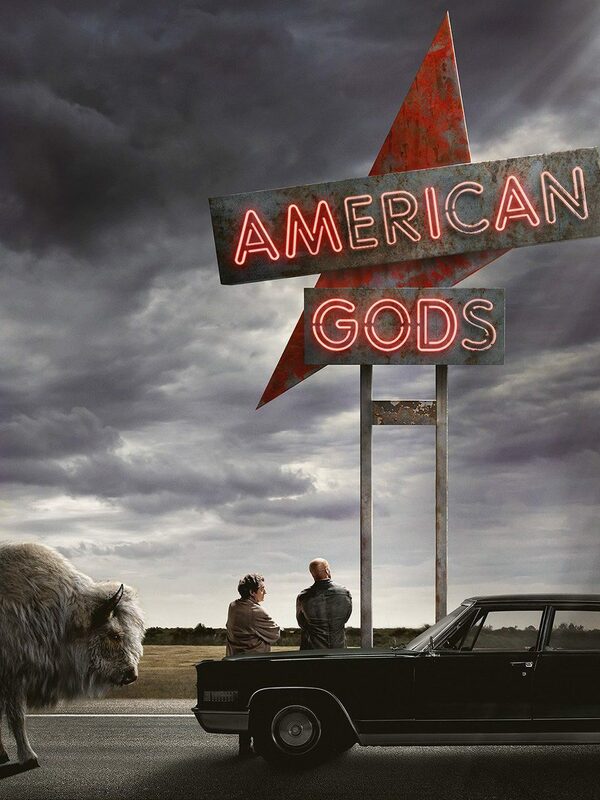 When using lenses that have a FOV of 10° or less and/or the fiducial targets are mounted above 20 feet (6.09 meters), there can be considerable amounts of visible noise in the CG background. To counter this effect, as of build 7229, Previzion has a feature called Smoothing. This noise is most noticeable with Airtrack 1.0. In Airtrack 1.5, the internal solid-state gyros have about 85% less noise, or about one sixth of the noise, when compared with Airtrack 1.0 in the same thermal conditions. It’s important to know that Smoothing is actually averaging out data to make up for noise. In a way, it’s not as accurate as when having it off. Therefore, as Smoothing averages out data, there is an accumulation of data being removed. Make sure to always, in between takes, use Clear Offset in Smoothing. 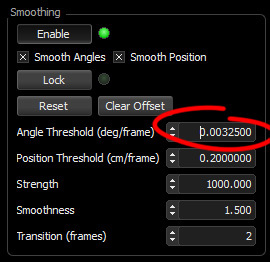 The default values in Smoothing have been optimized for use with Airtrack 1.5 and 1.0. If needed, you may tweak some of the values in smoothing to accommodate a particular scenario. If the values get changed too much, use Reset to reset all parameters to default values. 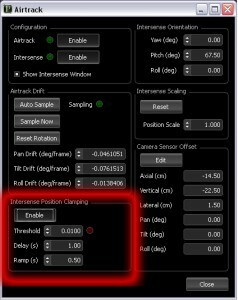 Note that the default value for “Angle Threshold” is optimized for Airtrack 1.5. The value resets to: 0.0020500. After build 7964, Previzion automatically detects and adjusts Airtrack Smoothing threshold values based on the model of Airtrack connected to the system. However, for older builds, please note that the value for Airtrack 1.0 is 0.0032500. And may need to be input manually. By default, Smooth Angles as well as Smooth Position are enabled. The first is in charge of smoothing out noise that occur in the Airtrack. The latter is in charge of smoothing out noise that occur in the Intersense. Having both on is usually more effective. Lock is intended to use on locked off shots where there is no pan or tilt, but zoom and focus still occur. This removes all tracking information and simply locks the background to the position last input by the sensors. Completely locked off shots are not commonly needed, but in the rare instances they are used, this is where to make the background lock as well. As the Airtrack is an inertial (gyroscopic) system, it has a certain amount of drift. The Airtrack Drift panel provides control for this. 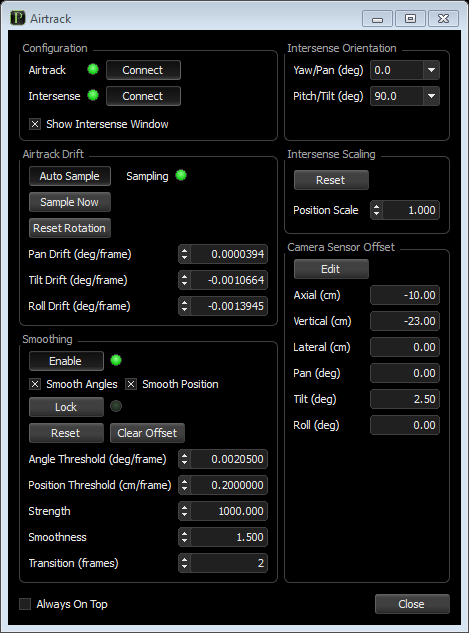 Leaving the **Auto Sample** box checked causes Previzion to continuously sample and correct for the rate of drift. When Previzion is started up, the system waits 20 seconds for the IS1200 to stabilize, then automatically aligns the coordinate systems of the two sensors. If you wish to manually align the coordinate system, click **Reset Rotation**. Deselect Auto Sample and wait 10 or so seconds for the green Sampling light to go out. While the camera is stationary, click Sample Now and wait 15 seconds for the Sampling light to go out. This performs a manual drift sample. Click Auto Sample again to re-enable it. The Airtrack drift is now matched, and will be continuously matched. With stage ceilings above 20 feet (6 meters) off the ground, the Intersense exhibits about +/-1 cm of positional noise, which is visible when the camera is stationary. 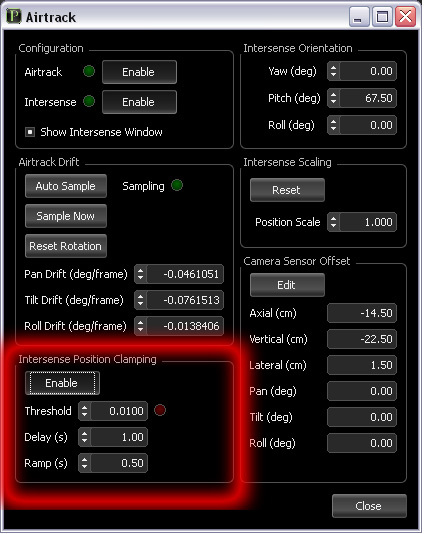 To halt the background motion, enable position clamping in the Intersense/Airtrack dialog. This uses the Airtrack as a motion detector, and clamps the Intersense position when the camera is at rest. Threshold is the amount of gyro movement per frame below which the position clamping will turn on if the lack of movement continues for a period of time. Ramp is the period in seconds that Previzion smooths the existing position to the current measured position when the camera is moved.